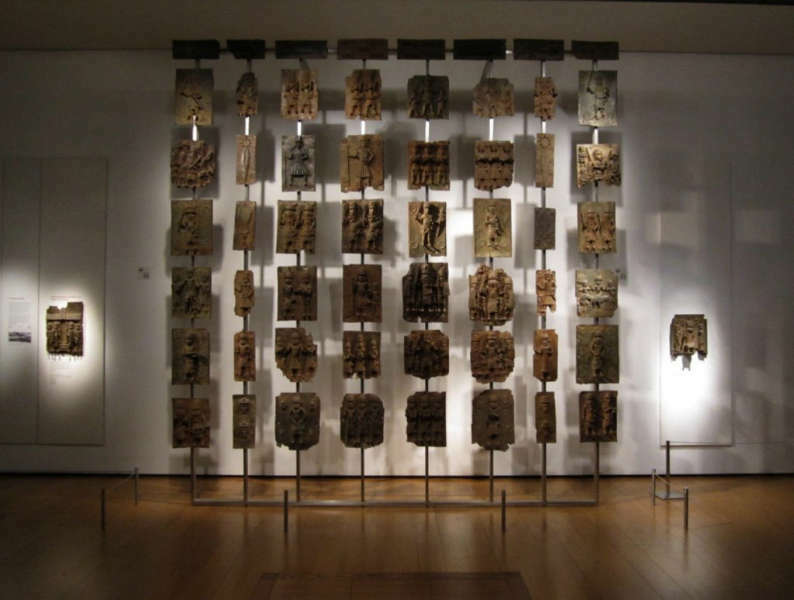 The 16th century bronze plaques from the kingdom of Benin are among the most recognized masterpieces of African art, and yet many details of their commission and installation in the palace in Benin City, Nigeria, are little understood. 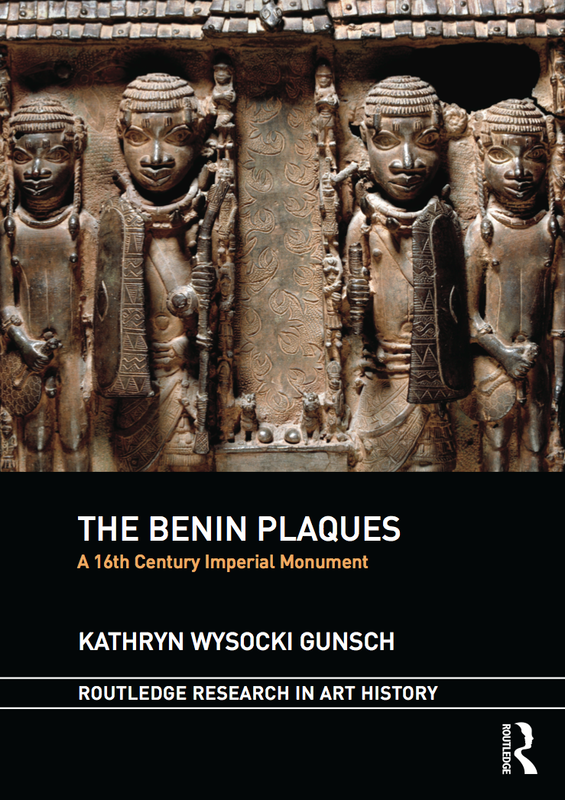 The Benin Plaques, A 16th Century Imperial Monument is a detailed analysis of a corpus of nearly 850 bronze plaques that were installed in the court of the Benin kingdom at the moment of its greatest political power and geographic reach. By examining European accounts, Benin oral histories, and the physical evidence of the extant plaques, Gunsch is the first to propose an installation pattern for the series. Gunsch spend more than four years on the subject, traveling the world to handle as many plaques as possible. If you are as obsessed as me with these, this is a must-read. I thought I’d do a small interview with her to tell us more about this research project. What brought you to Benin plaques ? I began studying Renaissance art history when I began my masters/PhD program at the Institute of Fine Arts, at NYU. I thought I would minor in African art history, because I had spent a lot of time in Nigeria, Kenya and Rwanda in my former career in international development. I was surprised at how anthropological the discourse in African art history was, especially compared to Renaissance art, and I realized I had more to contribute in this field, so I made African art history my main subject in my second year and never looked back. I have always loved 16th century bronzes — first in Italy and then in Nigeria — and so the Benin bronzes were a natural fit for a topic. There’s already a lot of literature of the art of the Benin Kingdom, when did you realize you could add something to the existing scholarship? I had a pit in my stomach when I walked into my first meeting about the project with Susan Vogel, who supervised my dissertation with Jonathan Hay. I had done a preliminary literature survey and couldn’t find the installation proposal for the plaques — I was sure I had somehow missed a major publication. When Susan said there hadn’t been any installation proposal, I knew I had something to offer. It still boggles my mind that no one has tried to reconstruct the 16th century audience hall before — but then again, it is a lot easier to do now that I can organize images of this 850+ corpus on Flickr! A mock-up of a view of the courtyard from the entryway (using just two plaques as examples in the drafting program). Image courtesy of Kathryn Gunsch. What do you see as the biggest revelation in your book ? My biggest revelation in the research was that when you look at the entire series, there are overlooked clues to dating and workshop method, as well as the original installation plan. I saw more than 640 plaques in person and another 100 by photograph, and looking at so many helped me find new insights. For example, all of the wide plaques have one of three patterns on their flanges, the small collar of brass perpendicular to the left and right sides of the plaque surface. In the book, I explain how these flange patterns are likely a signature of the head of the brass-casting guild, and that they certainly mark a progression in time. You can see how plaques with one pattern are in lower relief and show less daring use of the medium than the plaques with other patterns, a sign that the brass-casting guild is learning as it completes the commission. Looking at the reverse of the plaques, and the way the river-leaf pattern is applied to the front, I believe we have evidence for a guild production method that shrinks the dating of the corpus to less than 60 years. This is the more objective ‘new news’. An example of the patterns on a plaque flange. Image courtesy of Kathryn Gunsch. I’m curious to see what readers have to say about my more hypothetical proposal, that pairs and near-identical series can support a theory of which plaques were installed on the same pillar as each other, and why. It turns out that 36% of the known plaques have a near-identical pair. That’s not easy to achieve in lost-wax casting, where the clay mold is destroyed in the casting process. My installation proposal argues that the pairs and sets structure the corpus, giving the installation a framework within the enormous architectural space of the court. I’m trying to explain why the brass-casters would have gone to the extreme effort to make these pairs and sets, and what the Obas reigning at the time — Esigie and Orhogbua — could have achieved with this monumental commission. Did you get to answer all the questions you had ? No! We never get to answer all our questions, right? I am still not sure why the first set of plaques has a strict width of 30cm, and the narrow plaques are nearly all 19cm wide, but the later sets are more variable in their width. But if I had answered all my questions, what would I do next? How was the experience of going to Benin City yourself ? I loved visiting Benin City. I had spent a lot of time in Abuja and had visited Lagos before, but coming back to Nigeria and spending time in Benin City made me appreciate the importance of the kingdom’s art history today. This isn’t a dead subject — Oba Ewuare II reigns over a thriving court, with all the politics that entails. Seeing his father, Oba Erediauwa, during a title ceremony really brought that home. Thinking about Oba Erediauwa’s commissions in the Ring Road at the city center helped me focus on what kings achieve with the art works they sponsor. I didn’t have an audience with the Oba, but his brothers and other high court officials were gracious and patient with my questions, as was the then-new head of the brass-casting guild, Kingsley Inneh, and his uncle Daniel Inneh. I wish I could go back more often. What are your future plans ? Is there already another book/project in the pipeline ? I’m currently working on a theory that the altar figures are paired, just as the plaques are — and I mean paired to the centimeter, not just having similar iconography. It seems that triadic symmetry is a main feature of Benin aesthetics, and I wonder what we can learn about the heads and the altar figures if we apply that idea. I’m not sure it will be enough material for a book, but we’ll see! I’m looking forward to that; thanks for the interview Kathryn. If you want to learn more, you have to buy the book; you can can order it here ! This entry was posted in News, Publications and tagged Benin on January 10, 2018 by admin. Crowds sit in front of Amedeo Modigliani’s “Nu couche” during the “Artist Muse: A Curated Evening Sale” November 9, 2015 at Christie’s New York November 9, 2015. Image courtesy T.A. Clary / AFP / Getty Images. 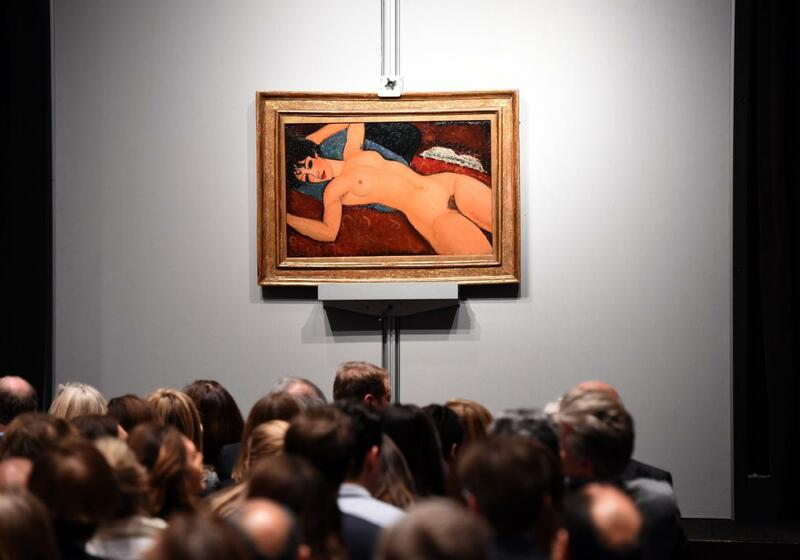 The event that marked the art world last year was the sale of Modigliani’s Nu Couché for $ 170,4 million at Christie’s New York (info). It became the second most expensive painting ever sold at auction. The painting is one of a series of great female nudes made for Léopold Zborowski that famously caused a scandal nearly a century ago when they were exhibited at Modigliani’s first and only one-man show at the Galerie Berthe Weill in Paris. Another painting of that exhibition ended up in the hands of a famous African art collector: Klaus Perls, the owner of Perls Galleries. 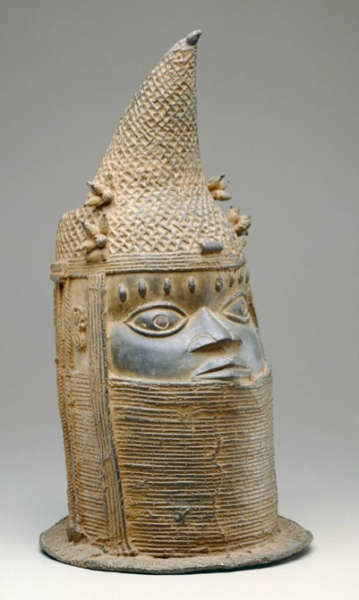 We know Perls for the 153 pieces of Benin art he donated to the Metropolitan Museum of Art in 1991. Kate Ezra wrote a great book about this collection, which is available for free here. 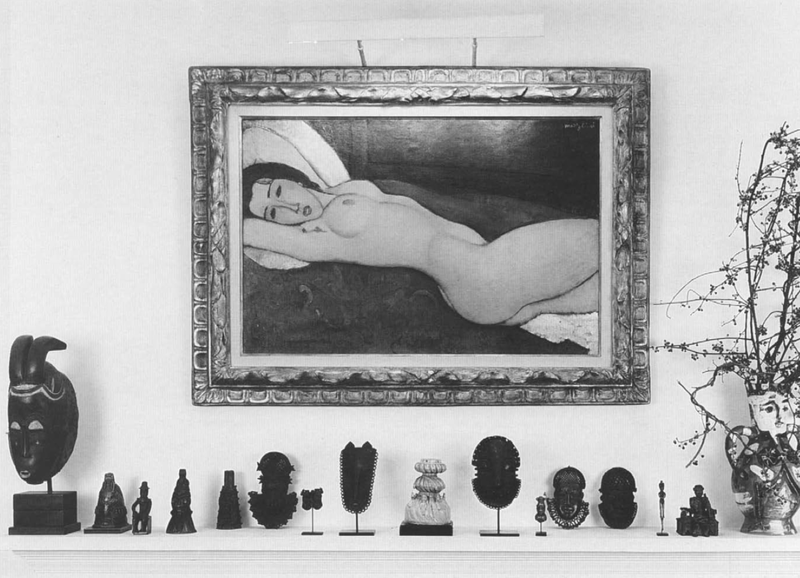 In 1997, Klaus Perls would donate his Modigliani to the Metropolitan; you can see it on the picture below. It’s strange to think that this one (extraordinary) painting is worth as much as his complete (encyclopedic) collection of Benin art. Anyhow, it’s great to see them together. The dining room of the Perls home, with Benin art (and a Baule mask) displayed beneath Nu Couché by Amedeo Modigliani, 1918.
ps fourth from the left, the attentive eye can spot a ‘Birmingham bell’, as previously discussed on the blog here. This entry was posted in Collectors and tagged Benin on January 13, 2016 by admin. I hope you all had a good Easter / Pesach / Holiday – I spend mine in Berlin, hence the lack of blog posts these last few days. My personal highlight was the Ethnological Museum. It will close in two years (and reopen in 2019 at a new location on the ‘museum island’ in Berlin’s city centre), so don’t postpone your visit if you haven’t been there. 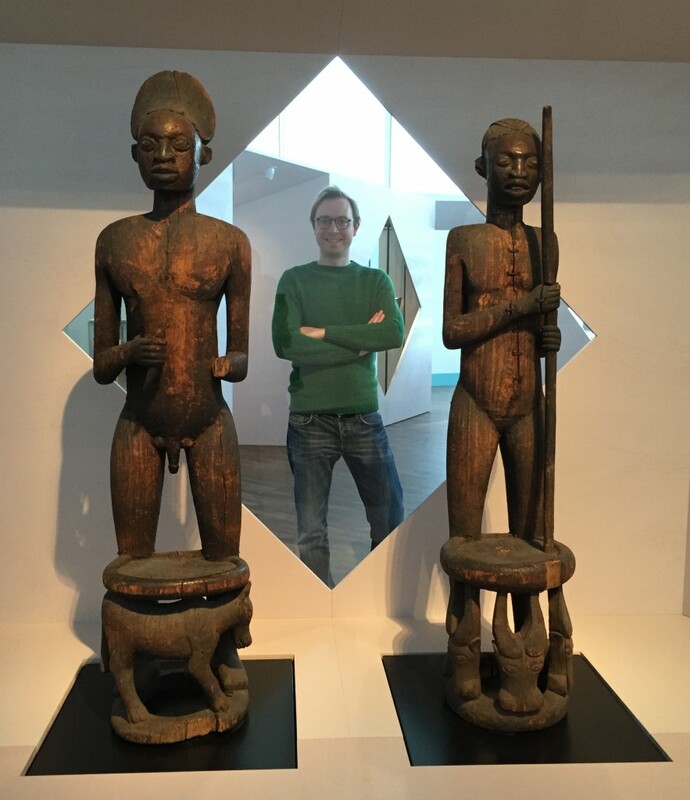 The selection of art from the Benin Kingdom is incredible and alone worth the trip – I was happy to learn the new museum will show even more objects. Furthermore, there’s a strong group of Congo material, some important Gabonese objects and a huge amount of art from Cameroon – all of these being collected more than 100 years ago. It is an amazing experience to see all these icons of African art in reality. Additionally, at the moment there’s a small exhibition about ‘object biographies’, curated by Margareta von Oswald and Verena Rodatus, including a stool from the ‘Buli workshop’, a group of Fon figures and the famous throne figures from Kom (info). After spending the day in awe in the museum, I realized I forgot to take some installation photos, but below a couple of snapshots. I can’t wait to go back, although I’ll definitely skip the museum’s restaurant next time – the bookshop, on the other hand, was very good. 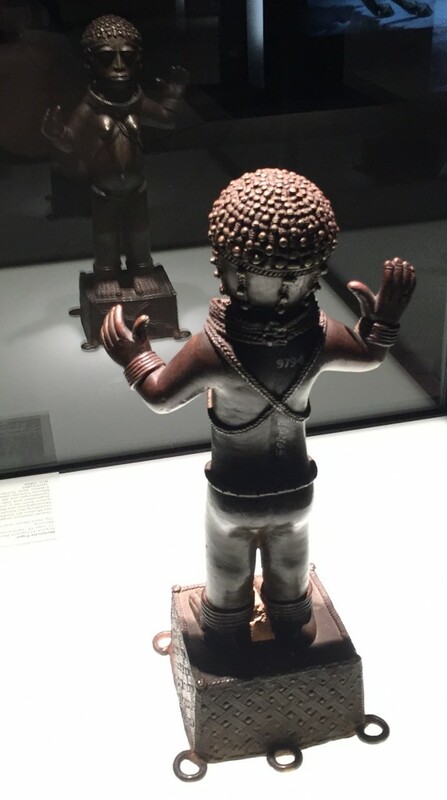 This entry was posted in Museum and tagged Benin on April 11, 2015 by admin. Image courtesy of the Ethnologisches Museum (SMPK), Berlin, Germany (III.C.8206). 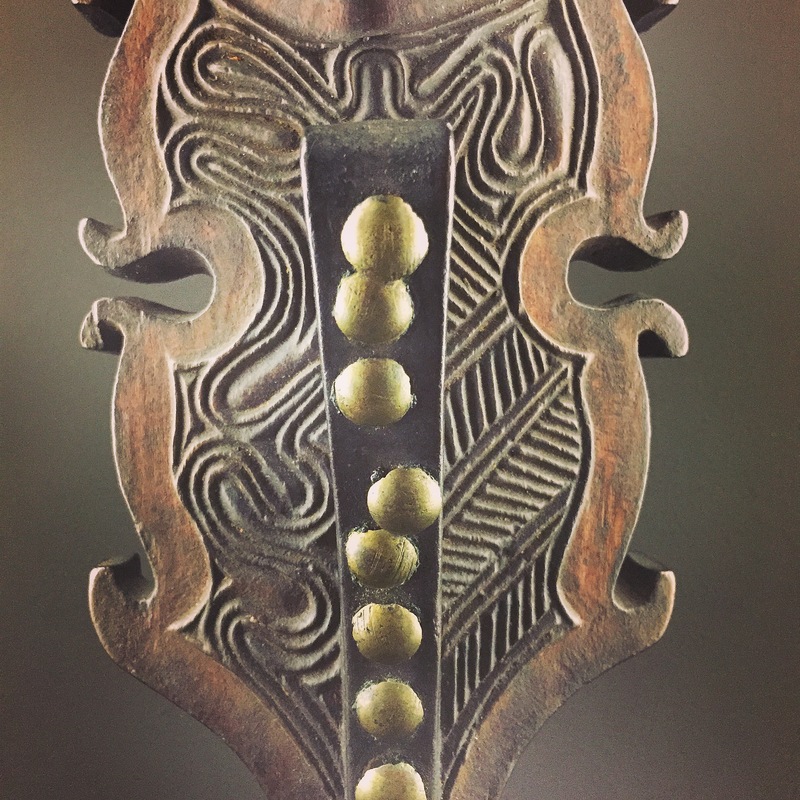 I’m currently obsessed with Benin plaques, so I thought I share one of my favorites. The above example, in the collection of Berlin’s Ethnologisches Museum, was attributed by William Fagg to the ‘Master of the Leopard Hunt’. 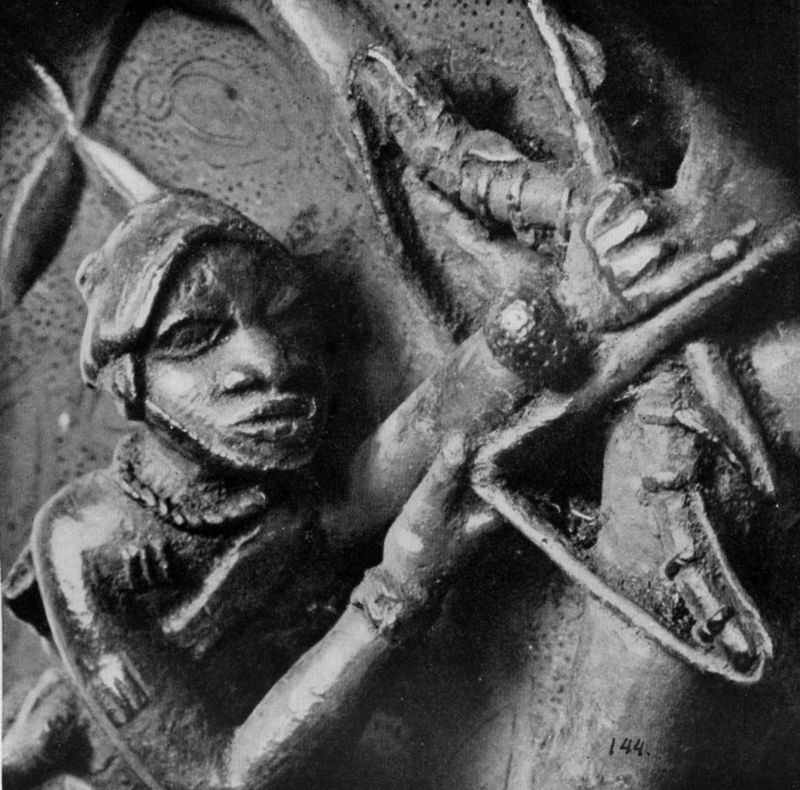 It’s one of the seven known brass plaques which appear to be by this artist, certainly one of the greatest of Benin bronze casters. 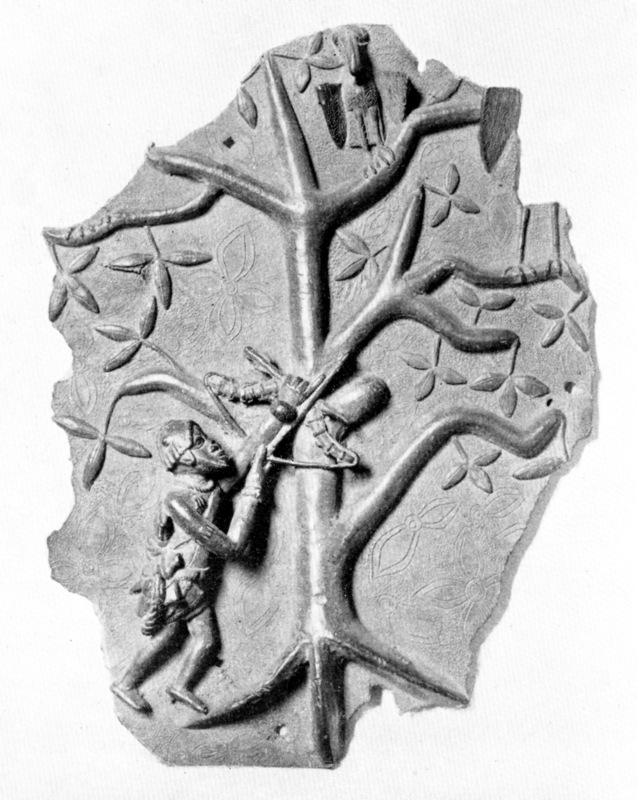 His works are free from the rather unimaginative rigidity of the great majority of the plaques, and this fragmentary scene of a Bini shooting at an ibis in the tree is often considered the most beautiful plaque of all. 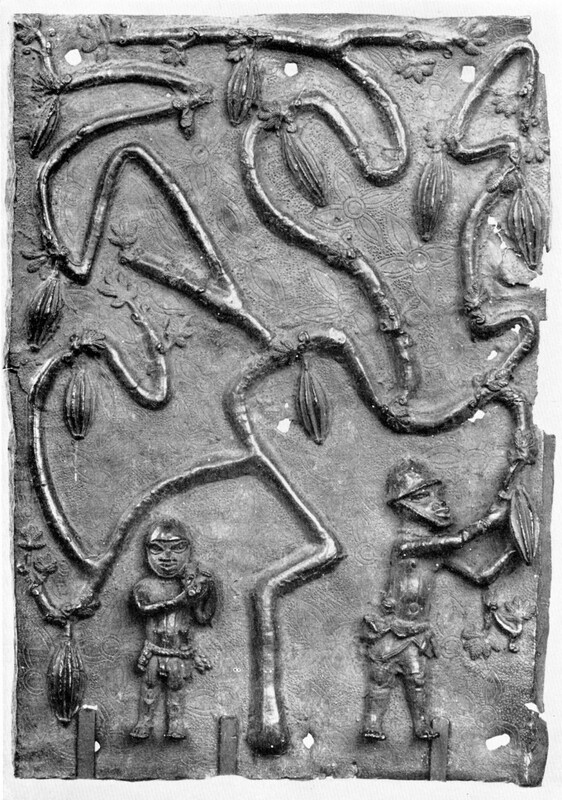 While most of the known Benin plaques show recurrent scenes of ritual, the work of the Master of the Leopard Hunt always depicts unique events, represented with a free sense of composition. 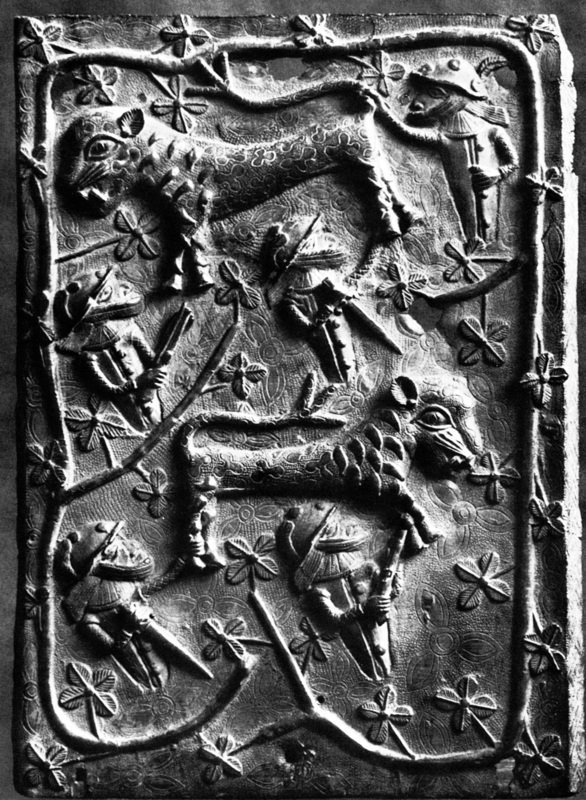 This ‘master’ got his name thanks to another plaque in the same museum, illustrated below, featuring a hunting party and two leopards – which is however less three dimensional. The Oba alone was allowed to slay leopards during his ritual duties. Leopards would be captured as cubs to be raised within the palace and so tamed in preparation for their immolation by the king. Image courtesy of the Ethnologisches Museum (SMPK), Berlin, Germany (III.C.27485). 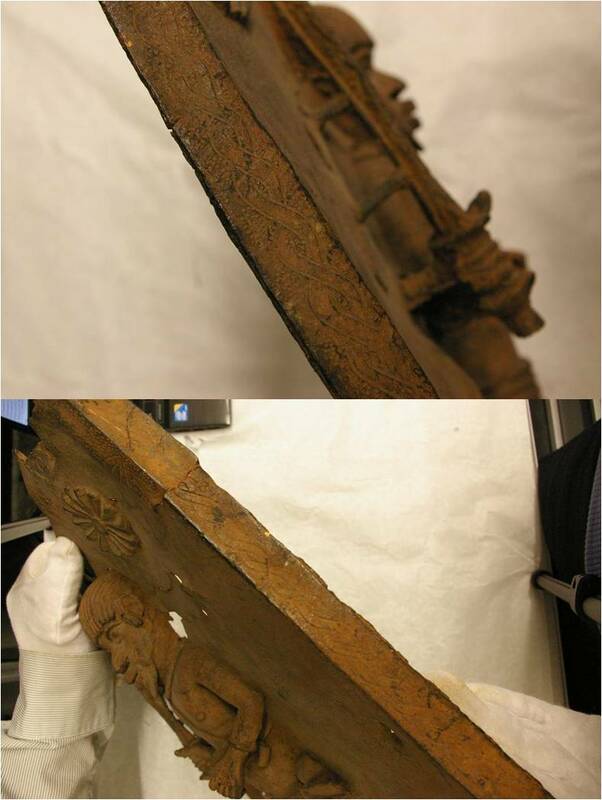 A third plaque from this artist show two Edo men harvesting fluted pumpkins – extremely unusual in subject matter. The two men’s dress is not that of farmers; their pot-like helmets mark palace officials. This complex plaque likely records a harvest for sacrificial reasons. In Benin this pumpkin type is equated with good things – success, unity and longevity – and is a standard sacrifice to two deities, the high god Osanobua and his son Olokun, god of the sea and wealth. New York’s Metropolitan Museum of Art has a rare container in its collection in the shape of such a gourd. Image courtesy of the Staatliches Museum für Völkerkunde, Dresden, Germany. One element that these three plaques have in common is that they all depict actions: an archer aiming at a bird in a tree or palace officials catching leopards or garnering fruits. 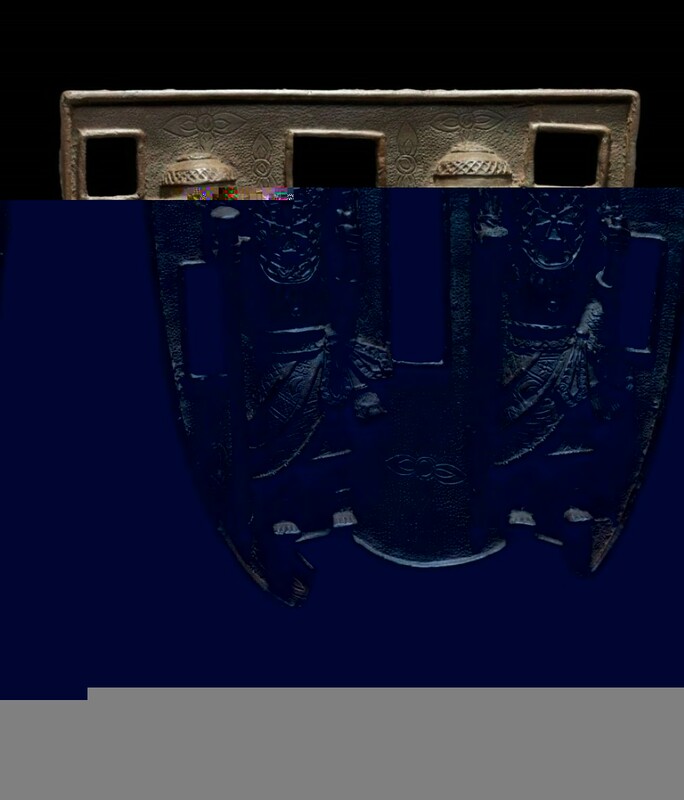 Together with the three-quarter view and the reference to an environment, this feature is alien to most African art and probably the result of a highly creative mind who dared to experiment with the standard prototype of the human-centered plaques. This entry was posted in Objects and tagged Benin on October 25, 2014 by admin. Image courtesy of the Pitt Rivers Museum (2012.33.1). 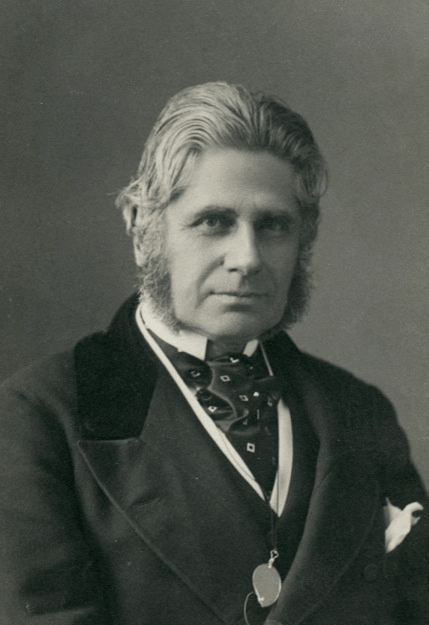 Augustus Henry Lane Fox Pitt-Rivers (1827-1900) amassed two large collections of art objects during his lifetime. 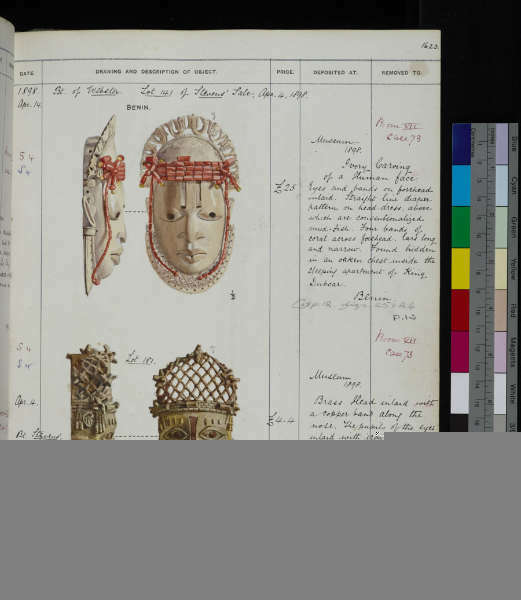 The first became the founding collection of the Pitt Rivers Museum at the University of Oxford. His second collection was displayed at a private museum in Farnham, Dorset during his lifetime and stayed in his family’s hands. This museum was eventually closed in the 1960s and this collection has now been dispersed. It is listed in nine beautifully illustrated volumes of a catalogue now part of the collections of Cambridge University Library. 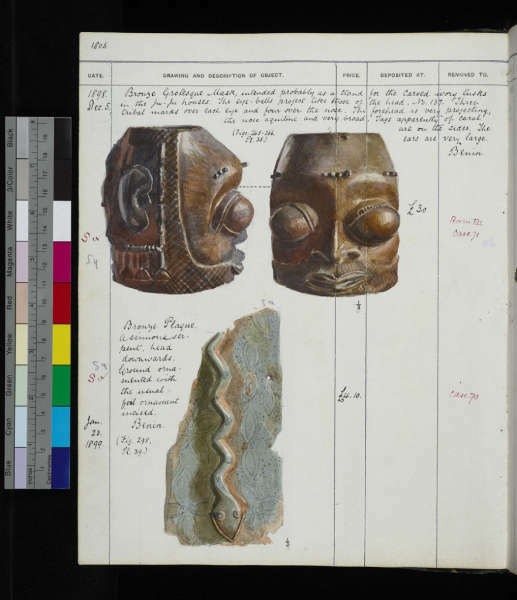 The Pitt-Rivers museum has made both the accession catalogues of their collection, as well as the above mentioned nine volumes of Pitt-Rivers’ private collection digitally available for consultation here. You can explore the pages of the catalogues by selecting a volume or by searching for a specific term using the ‘Search the volumes’ button. Most of these volumes are beautifully illustrated with detailed color drawings, accompanied by a description, the measures, the acquisition date, the price and the provenance. In other words an incredible research tool. Besides Oceanic and African art (with a focus on Benin art), these catalogues also contain art from other parts of the world. 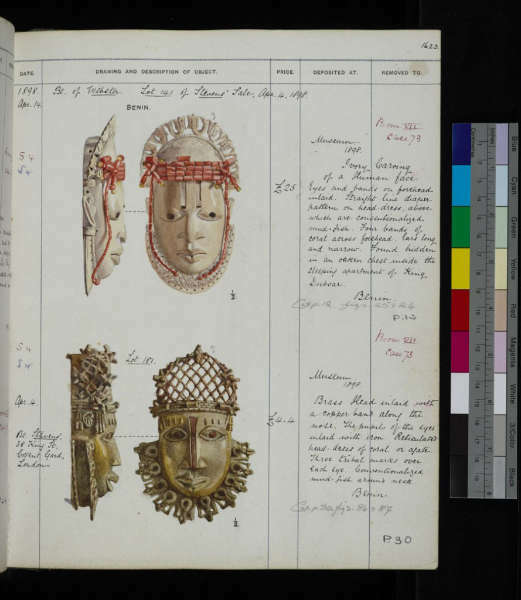 If you’re looking for a specific object, it can take a while (I did find Bulgy Eyes) – but these inventories are so interesting browsing them page by page is a pleasure to do. 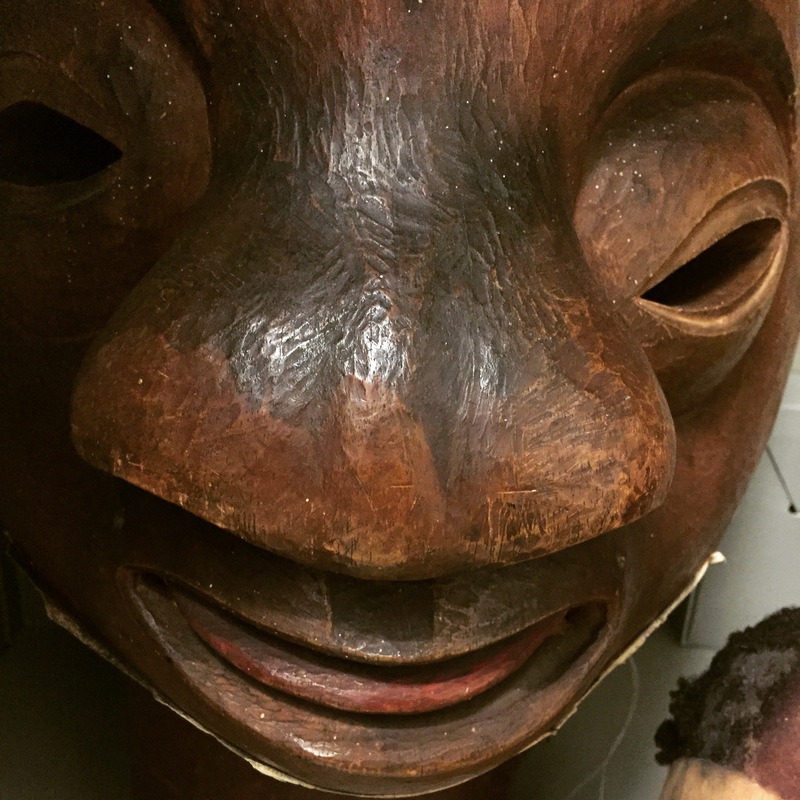 If you wish to learn more about the life and collections of Mr. Pitt-Rivers, do visit the Rethinking Pitt-Rivers website. With big thanks to Marc Assayag for the tip. Sharing is caring! Image courtesy of the Pitt Rivers Museum. This entry was posted in Collectors, Research and tagged Benin on September 22, 2014 by admin. 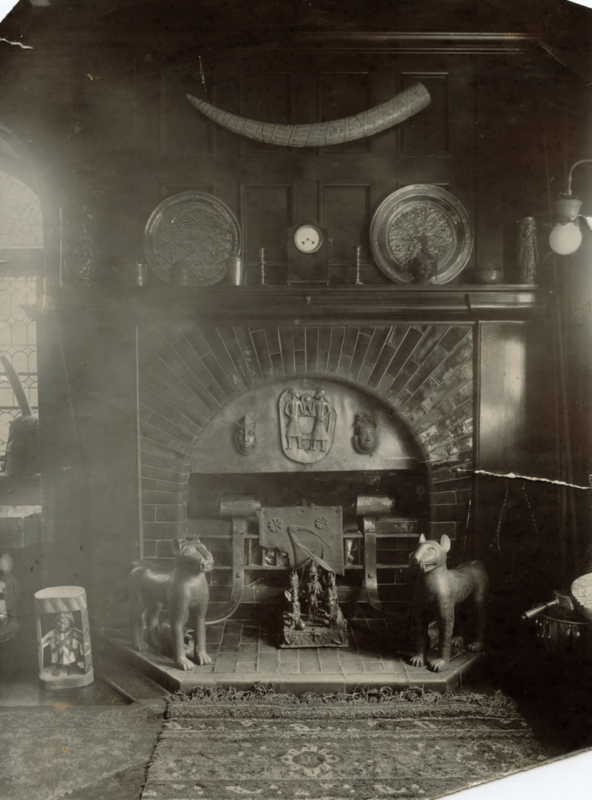 Ben Hall recently found the above interior photo on a Brighton flea market. Talking about a room full of treasures. It appears to be a rare picture of the interior of George W. Neville’s house in Weybridge. Neville (1852-1929) worked for Elder Dempster, a shipping company, in Lagos. 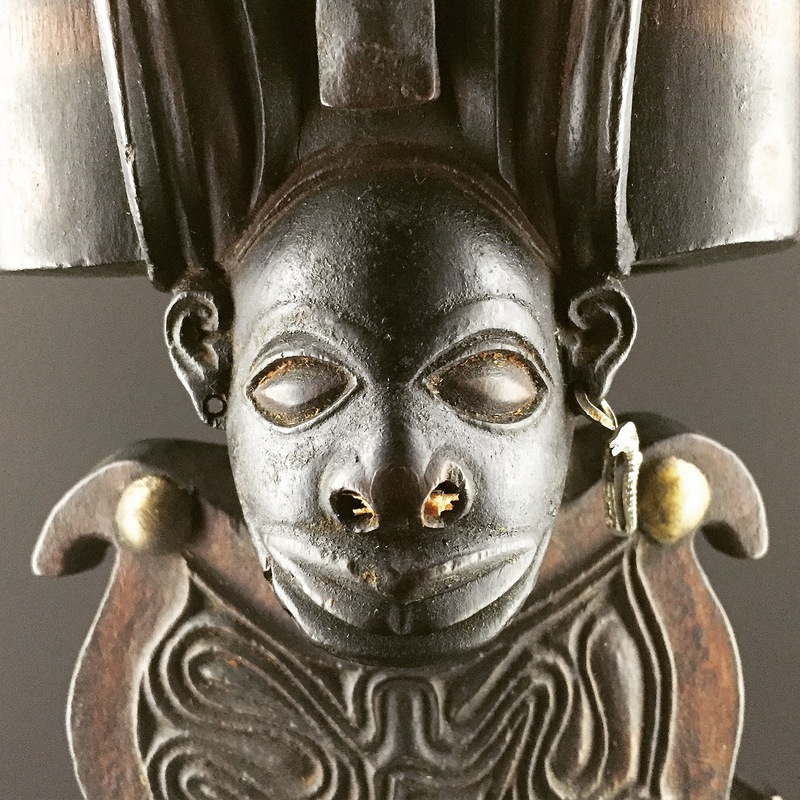 After his death, Neville’s collection (128 objects big) was sold by Foster in London on 1 May 1930, the auction was titled Highly Important Bronzes, Ivory & Wood Carvings from the Walled City of Benin, West Africa (G.W. 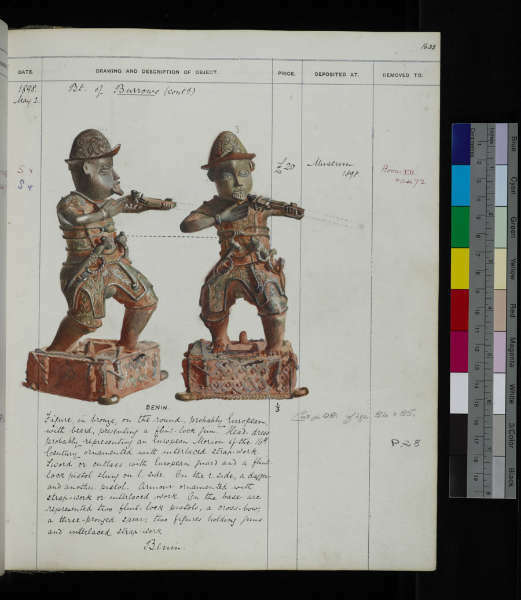 Neville Collection from Benin Punitive Expedition of 1897). So, where are these objects now ? The pair of Benin bronze leopards are in the National Museum in Lagos, Nigera. They were bought by Charles Ratton in the 1930 auction. Louis Carré acquired them from Ratton after the famous exhibition at MOMA in New York in 1935 and in 1952 they were bought for the new National Museum in Lagos. The plaque with the two Portuguese soldiers is currently in the Musée du quai Branly (#70.2002.4.1) in Paris after passing through a number of hands (Ratton, Carré, Pleven) since Neville owned it. Lastly, the bronze altar between the leopards is in the Fowler Museum in Los Angeles (X65-9088), having been given to them by the Wellcome Institute. With thanks to Ben Hall, Tim Teuten, Hermione Waterfield and Susan Kloman for the excellent sleuthing – remember this picture came without any contextual information. Still unaccounted for are the big head on the windowsill on the left, the Benin plaque with the bird, the two hip ornaments on the chimney, the ivory tusk and the Yoruba stool. This entry was posted in Research and tagged Benin on September 8, 2014 by admin. Image courtesy of the Detroit Institute of Arts. In the meantime, the 150-page valuation of the works the city of Detroit can sell has been published. You can see the list here. Below the included African and Oceanic art. 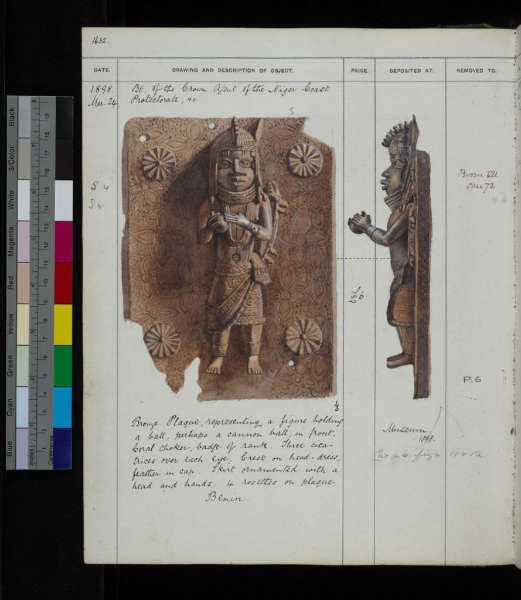 This entry was posted in Museums, News and tagged Benin on December 20, 2013 by admin. Last week I coincidentally stumbled upon a object handling session in the Asia gallery of the British Museum. Volunteers give visitors the unique opportunity to handle objects from the museum’s collection in six of the museum’s galleries. At the end of this year it will also be possible to handle African objects. More than 90 volunteers are involved. The desks are open daily, seven days a week, between 11.00 and 16.00. 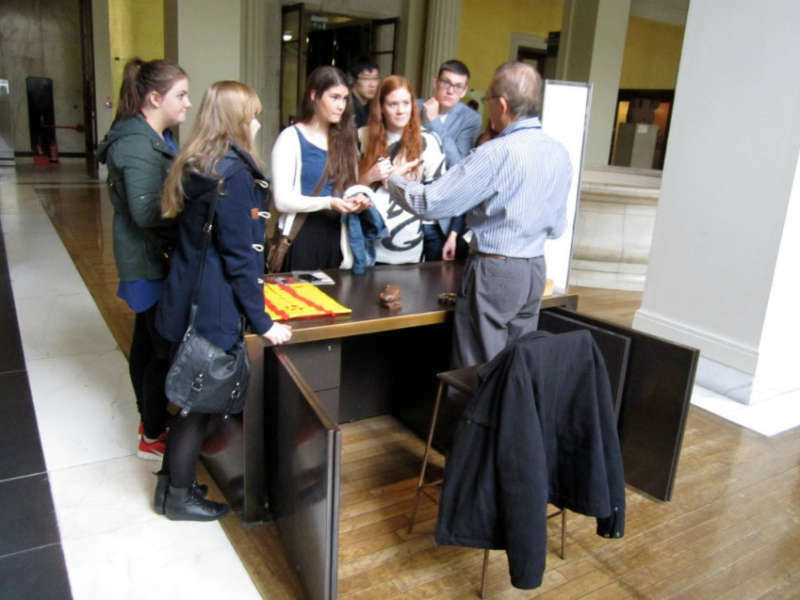 I wasn’t aware of this “Hands On Desks” programme (apparently already running since January 2000) and think its a wonderful idea to get the objects out of their glass cabinets and into the hands of visitors. As collectors, curators or dealers, most of us know that you can’t replace the feeling of actually touching an object. An evaluation of the programme showed that almost all visitors to Hands On desks said that the experience increased the quality of their visit and brought it to life. I sincerely hope other museums will follow the British Museum’s example. A whole wall of magnificent Benin plaques at the British Museum, London. Image: BC. 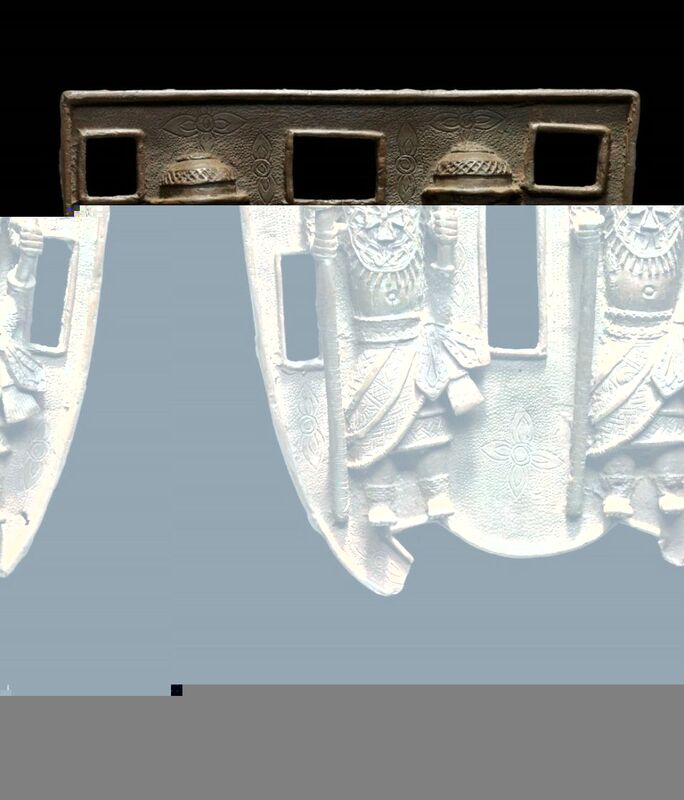 This entry was posted in Museums and tagged Benin on October 26, 2013 by admin. Relief plaque showing a dignitary with drum and two attendants striking gongs. Edo peoples, Benin kingdom, Nigeria, 16th–17th century. 43.2 x 27.9 cm. Courtesy Museum of Fine Arts, Boston (#L-G 7.32.2012). Accompanied by a drum roll by the above musician, The Museum of Fine Arts, Boston, has unveiled a new gallery dedicated to the Robert Owen Lehman Collection of bronzes and ivories created in the ancient Kingdom of Benin, located in present-day Nigeria. The single greatest private holding of objects from Benin (not to be confused with the West African Republic of Bénin, the former Dahomey) the Lehman Collection was a gift to the Museum in 2012. Lehman, a banker and a great-grandson of a founder of Lehman Brothers, had purchased the Benin sculptures between the 1950s and the 1970s. On display for the first time in Boston, the 36 objects (two Lehman Collection loans are included) comprising 30 bronzes and six ivories, all date from the 15th to the 19th centuries. The gallery, which was completely renovated, also includes two early ivories from Sierra Leone and Guinea, crafted by African artists for the European market. Read all about it here. For an inventory of the donation, including provenances, click here. 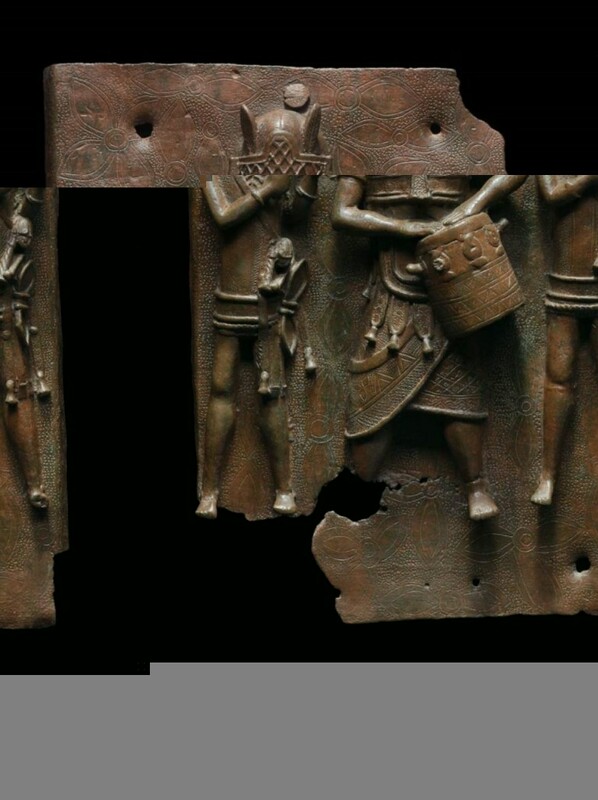 The plaque above has a typical provenance for a Benin bronze: Ex William Downing Webster, London; sold by him on October 15, 1898 for £ 19 to Lt.-General Augustus Henry Pitt-Rivers (b. 1827 – d. 1900), Farnham, England; until the 1960s, kept at the Pitt-Rivers Museum, Farnham. The collection of the privately-owned Pitt-Rivers museum passed by descent through Augustus Henry Pitt-Rivers’s son Alexander Lane Fox Pitt-Rivers to his grandson, Captain George Pitt-Rivers (1890-1966) and his common law wife, Stella Howson-Clive (Pitt-Rivers). The museum closed in the 1960s and the collection was sold. 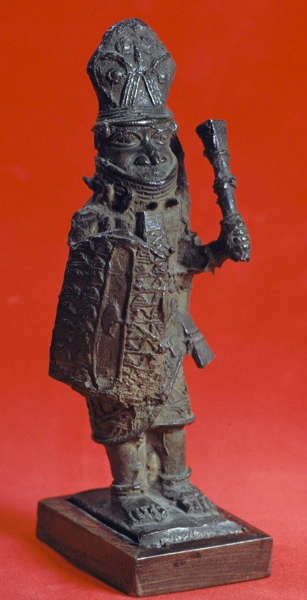 The provenance of these Benin bronzes remains the origin of a lot of controversy. What the MFA forgot to list was that Webster most likely purchased this plaque from a British soldier returning from the Benin Expedition, which had sacked the kingdom’s capital. So, understandably, not everybody is amused by this donation. For the reaction of the Nigerian National Commission on Museums and Monuments, that demands a return of the objects, click here. More on the story on the Elginism blog here, and lastly, a more nuanced view by Chika Okeke-Agulu here. Pectoral with two officials. 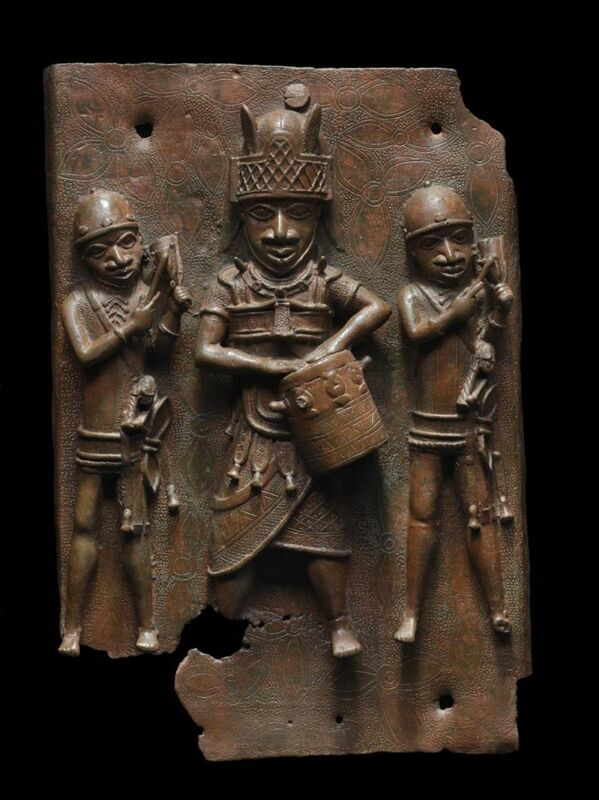 Edo peoples, Benin Kingdom, Nigeria, 16th–17th century. 31.1 x 28.6 cm. Courtesy of the Museum of Fine Arts, Boston (#L-G 7.28.2012). This entry was posted in Exhibtions, News and tagged Benin on September 26, 2013 by admin.